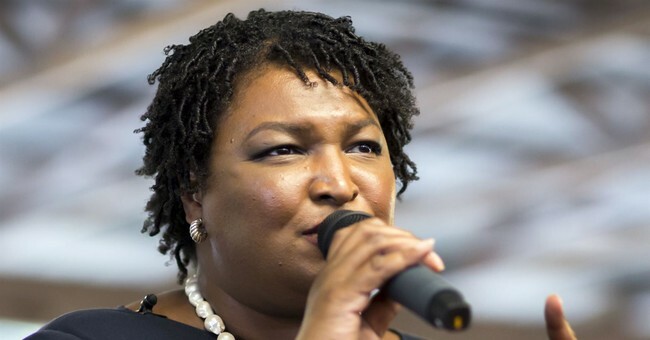 Democratic candidate Stacey Abrams offered no signs she plans to concede in the Georgia gubernatorial race during a speech in the early morning hours of Wednesday. "I want to say this: if I wasn’t your first choice or if you made no choice at all, you’re gonna have a chance to do a do-over," Abrams said during the speech to supporters, alluding to a potential recount. "Votes remain to be counted, there are voices that remain to be heard," she said. "We believe our chance for a stronger Georgia is within reach." Abrams's remarks came shortly after her campaign manager Lauren Groh-Wargo said her campaign believes there are outstanding votes in Democratic areas as well as provisional and absentee ballots that could lead to her victory, Talking Points memo reported. Over the weekend, Georgia Democrats said they found a bunch of surprise ballots that could sink Republicans in the state. It’s part of a long drama regarding ballot counting in the states of Arizona, Florida, and the Peach State that have raised legitimate concerns that Democrats could be engaging in dirty tricks to steal elections. Democrat Stacey Abrams is continuing her fight to force a runoff in the Georgia governor’s race and filed a new lawsuit Sunday to block counties from tossing out some absentee and provisional ballots. Abrams has not conceded to Republican Brian Kemp, who has declared victory and said that there are not enough outstanding votes to change the outcome. Kemp’s lead has narrowed since Tuesday, but is still above the 50 percent required for an outright win. As of Sunday afternoon, the secretary of state’s website showed Kemp with 50.3 percent to Abrams’s 48.8 percent. The Republican is leading by less than 59,000 votes out of more than 3.9 million cast. Over the weekend, 5,000 votes were added to the tally, most of them favoring Abrams, which the campaign has cited in urging that county and state officials not rush the process but work to make sure all ballots are collected and counted. The campaign said Abrams would need more than 21,700 additional votes to force a runoff or more than 19,300 to force a recount. The secretary of state’s office reports 21,190 provisional ballots. Abrams’s campaign aides estimate there are at least 26,000 provisional ballots, based on information they gathered from county officials. It is unclear how many of those ballots have been counted or remain outstanding. It’s unclear how many are left outstanding. Well, that’s a problem. And it’s one that’s at the heart of Florida’s elections, where two of the most Democratic counties not only weren’t giving regular updates as required by state law concerning outstanding ballots, but their counting processes were ruled to be in violation of public records laws. And they have a long history of negligence and incompetence as well. We’re about to enter a very nasty closing chapter to the 2018 midterms.